That year I spent in Paris as a college student pretty much changed me forever, as in, I decided to become a ski bum and wait tables in Aspen rather than pursue my studies as an international corporate lawyer. We are all affected by different places in different ways for a variety of reasons. France has something about it – where everything is enhanced, like I took a handful of mushrooms and everything tastes better, makes me laugh harder, looks more beautiful, and makes me love much harder. I mentioned last week that I have a recurring dream that I’m in Paris and it is bathed in a warm, very bright, white light. What is it about this country I love so much? Louis Pasteur, a Frenchman, invented the process of pasteurization to kill bacteria (some of it good; some of it bad) in cheese and dairy. As it turns out, it also kills flavor. The FDA decided Americans must be protected and deemed unpasteurized dairy unsafe for consumption. The French don’t see it that way. That’s ironic. Therefore, cheese and butter are much better here, and therefore, life is much better here. It is quite possibly illegal for anything to be un-stylish, unattractive, or gasp, unappetizing. People sit at cafés leaning into each other over tiny tables sipping wine, smoking cigarettes, staring and speaking to each other intently. If we’re being honest, I’m not so fond about the cigarette smoke part but it’s something about Paris you just get accustomed to or go home. Utility workers take lunch breaks by setting up a makeshift table using workhorses and a piece of cloth to have their lunch break with their baguettes and cured meats, and salad. Prostitutes blatantly and openly work the perimeter of the Bois de Boulogne (one of Paris’ largest parks). That means, I argued to Patrick, he could ostensibly just go out to the park and get laid in the woods any time he wanted to. I didn’t notice any men offering the same service and complained to him about this to which he responded all I had to do was go to a bar. 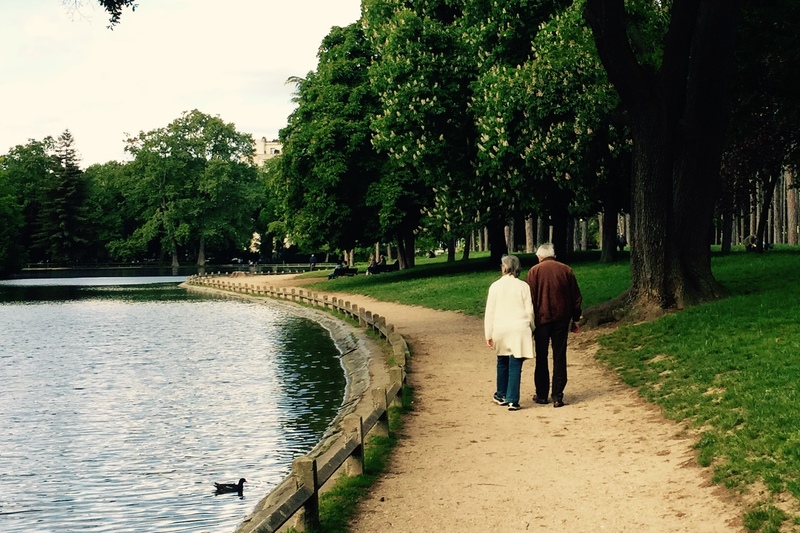 Couples in their 80s walk in the park holding hands and being in love. See above photo. There are many people who feel absolutely OK with pulling over, pulling it out, and going to “the bathroom” on any bush or tree. Patrick has one important criteria for choosing a place to live. He must be able to pee freely in the bushes. Little did we know that happens regularly in Paris. Wine (and food) are worshipped. This is a religion I can subscribe to. 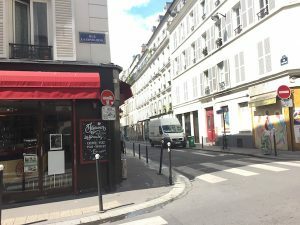 On Sunday morning in Paris, the streets are deserted, zipped up and shops closed. You can’t so much as get a café and a croissant. Because everyone is actually sleeping in. And spending time with family. People really do make out in the streets and along the river and part of me wants to call them out on it as I walk by, begging them not to be so cliché. However, the endless narrow streets with the tiny cafés, small boulangeries and charcuteries and the Haussman architecture which open up to the wider boulevards with the leafy trees and people aimlessly strolling every which way you look, is so romantic it really does hurt. Outside of Paris, stores are closed from 12:30 to 2 pm every day. And many are closed Sunday and Monday as well. Why? Because proprietors are home with their families (and therefore everyone else including potential customers should be too). These people need a life, and not an American one, so it is apparently acceptable that a working person can’t do their grocery shopping for the week on a Sunday, or say, run some errands during their lunch hour. because going home and having lunch with the family is priority. That would never fly in the States. We’re in the countryside of SW France as I finish this post up and everywhere I look I want to take a photo because France is just so…. French. 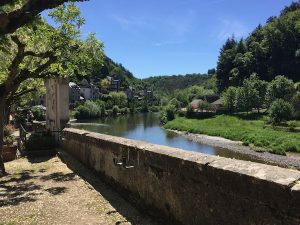 Moss-covered stone walls, stone buildings, narrow roads lined with trees, meandering rivers, people on bikes with baguettes and an occasional “mec” (guy) pulled over and pulled out, quickly relieving himself. You don’t necessarily see these things staying at the Marriott on the Champs Elysées, or taking the double decker “unlimited on and off” tour bus and riding the elevator to the top of the Eiffel Tower, sitting in front of the Sacré Coeur looking out at the stunning view. You don’t learn this walking through the Musée d’Orsay or the Louvre. This is not a judgment against those activities. They are awesome and one learns many things there which I did not, because we did not do any of those things. 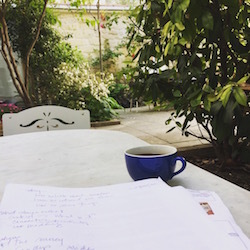 Instead, we sat back in our garden in our Airbnb in the residential Batignolles neighborhood, with its restaurants and cafés, people chatting with each other on corners, and walking their dogs to the nearby park. We planned a four or five mile run each day in a different area: Monceau Park, Bois de Boulogne and the Rives à la Seine which I’ll write about more next. We met up with friends who live in Paris and went to great neighborhood joints with excellent food. The common denominator in that list above: a re-ordering of priorities. There is a unique blend of not giving any f@$ks about some things like convention as we know it, but giving big f@$ks about things like life and love. *I’m really sorry to use the F-bomb. I didn’t feel any alternatives would work. Perhaps that is how it came to be I decided I didn’t want to pursue a life as an international corporate lawyer because I want to end up like that couple pictured above, which I took in the Bois de Boulogne on a springy Thursday morning. And I don’t think the lawyer path gets me there although it would afford me that room in the Marriott on the Champs Elysées. It just depends on your desired end game. PS. 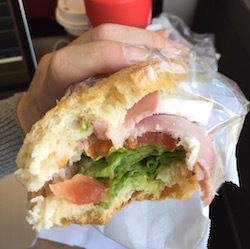 This sandwich is one of the best damn things I’ve ever tasted in my life. I therefore had to take a picture and I swear I wasn’t on mushrooms. I was in France. You’ve made some pretty amazing choices in life…. even the ones that drove you crazy but got you from there to here!! And I’m so glad you’ve chosen to include this wonderful talent….. writing!! Jennifer, since I’m a member of the Fortune Religion, I so deem you are a member of mine. Thank you very much. and thank you for encouraging it mom. I wish more Americans would do what you do, Lisa. I don’t mean that in a derogatory way, either (or, at least, that’s not my intent). I just find, as I’ve traveled, Americans are among the most insular of people, and I truly believe that’s because the knowledge they have of other places and its people come from biased media or uninformed friends. If they’d only travel outside their own border, they’d see the world much as you’ve discussed it so beautifully here. Travel really does change your perspective on everything. And our country doesn’t even welcome it – we don’t have money exchanges in small towns and cities like they do here. People don’t speak foreign languages like they do here. That insulation starts right here obvs in the U.S. – after visiting Japan, I have completely changed my perception of visiting Japanese. What a challenge it is to be in a country where you can’t even read the characters/letters! Now I get it! And patrick and I are just carrying around Canadian flags rather than putting it on our backpack. Hope that doesn’t appear odd. Makes me want to go live in France! Wait, I already do! You’ve captured the beauty of life here so well!